If you are looking for a great anime to watch after school or work, when you are tired of all the drama and just want to vegetate, then this is something I'd recommend. It takes a slice of life approach to a fantasy world where animals talk and act like humans. You only need to sit back, relax, and enjoy the silly plot and polar bear puns. Note: I ended up liking the music to this series a lot, and they cycle through different ending themes every few episodes, so I'd recommend not missing them. The show is okay. I feel like the foundation of the Polar Bear's Cafe gave it a lot of wiggle room for interesting unique plots and characters since the main cast is a bunch of animals in a flexible setting, but the show doesn't make real use of this resulting in a super plain experience. Like if you look at the characters, Polar Bear has an interesting personality and I earned a smile from him time to time, but that's really all I could get. He likes puns and is fairly witty... cool. Penguin and Panda though are probably some the flattest characters in the whole show next to maybe Panda's mom. Penguin literally is just your classic "Friend A" type and Panda only seems capable of playing the role of "cute and lazy". He doesn't even do anything except giggle, sleep, and eat! How does that grab your attention??? I understand slice of life shows tend to circle around taking fairly mundane ideas and changing them into fun little adventures and you can tell the show tries to go for that, but it really falls flat in that department, and almost all of it comes from the fact that it's difficult for flat characters to shape a plain idea into something interesting. Of all the 1 anime I've seen so far, this is easily the best. It's got a great sense of humor, plot lines littered with twists and turns, and delightful characters that propel each episode's beats and jokes into the stratosphere. Absolutely recommended to anyone who loves animals, sitcoms, anime, or any combination of the three. I'd love watching this show - great animation, a lot of humor and also very calm and somehow, relaxing - all the animals are very well drawn, their behaviour are just perfect, so close too reality, it's impressive!! The few human caracters are fine too - I never get bored during the 50 episodes. You don't understand how much I love this anime, I appreciate the artwork, the setting, and how calm it makes me. I can rewatch this anime and never get bored of it. I think my favourite episode is the one when Polar Bear and Grizzly Bear were kids and they made salmon cream stew. Omg I hope everyone who watches this anime will love it as much as I do. Enjoy! 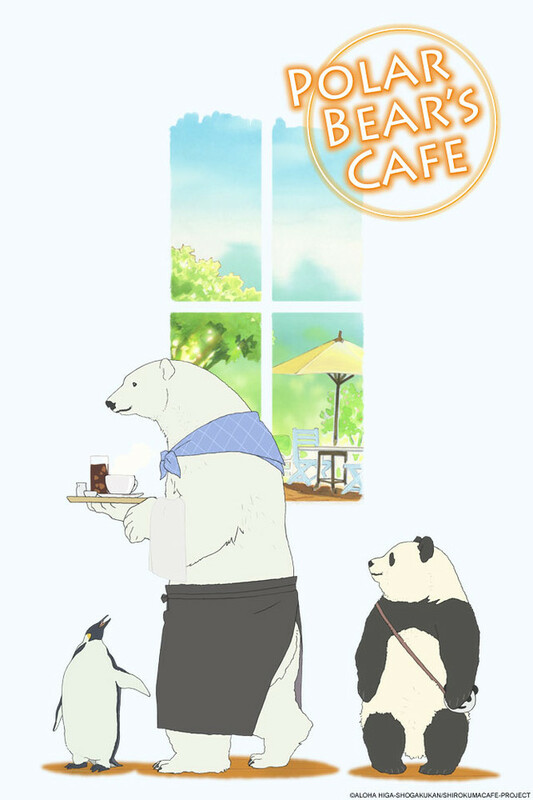 Complex plots, political intrigue, epic arcs, fantastic locales... Shirokuma Cafe requires none of them. It's charming, clever, unique, and constantly engaging, highly worth the watch. This show has fully earned its high ratings, and one can only hope it never overstays its welcome. More please! Best Show Ever!!! Its so light hearted, easy to watch kind of show that anyone will love. This is by far one of the best anime I've seen! The art is nice and unique. The story is silly and easy going. Characters are relate able and lovable! Great for all ages - cute silly lovable series. A MUST WATCH! **SLIGHT SPOILER** I kinda wish we got to know penguin-san more though, like his family/origin - likewise for polar bear. Great art style, very funny, good for those who are learning Japanese. It's hard to be in a bad mood with this anime. Characters are very relatable, and it's a very laid-back anime... kind of like being at an actual cafe. The animals have a lot of detail, and actually have all the features of those animals in real life! What an amazing show! The art style is realistic, really well done. The voice acting is just perfect. Each of the characters get rounded out over the course of 50 episodes, and just when you think you know them, they surprise you. Really recommend this, even if slice-of-life is not your thing. It is funny, light and at times hits you with depth you didn't suspect. All in all, very satisfying and I hope they make a next season and don't change a thing!